3.9 out of 5 based on 15 bloggers and 1 commenters. 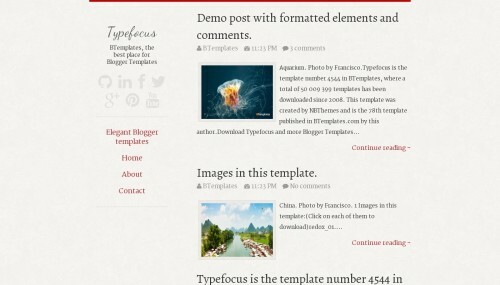 Typefocus is a free blogger template adapted from WordPress with 2 columns, responsive design, left sidebar, minimalist, footer columns, social bookmarking icons, posts thumbnails, a background pattern, simple look and tumblr style. Thanks– I am checking out Typefocus!